The Eastern Shore got it! Just like the NAM I posted this morning (below), this regional radar from 1:30pm was almost right on. So, why did we miss it? Again? There is an answer for everything and at this point, I am still trying to figure that out. My only guess now is that as the precipitation enhanced thanks to that vort max and rising air on the Eastern Shore, there was subsidence or sinking air around it. That is what we got, which inhibits cloud formation- and we got the sun to return. Here is the web version of StormCenter Doppler from earlier afternoon. 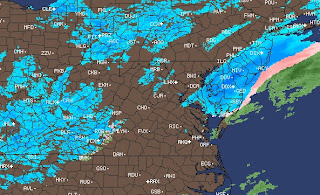 You can see the distinct line of snow on the Eastern Shore. It developed earlier than I expected, but also moved out earlier. That vort max I highlighted is most likely what did it, but it moved through much faster and farther east to do anything for the west side of the bay. 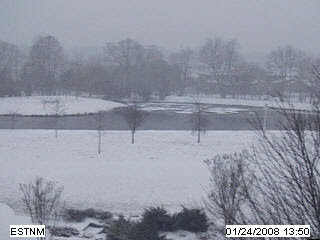 Below are Weathernet Camera snapshots of the snow in Easton and Ocean City. You can see the feilds in Easton covered with the 1-2 inches expected. Ocean City got more than they expected. 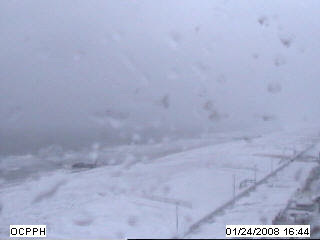 That is the beach covered with snow, and a very gray Atlantic Ocean in the background. Snow Showers- More - Eastern Shore! First Flakes- 10:30am- 1:30pm Sloppy roads!!! CHANGES- It's back on for Monday Morning. Pattern Change- Winter Will Return. SOON! Heavy Rain Friday, Snow Next Week? Intriguing Virga! No Snow- No Shave.